The best security technology in the world cannot help you unless employees understand their roles and responsibilities in safeguarding sensitive data and protecting company resources. This will involve putting practices and policies in place that promote security and training employees to be able to identify and avoid risks. We're not talking about "a one-time orientation video for new hires. We are talking about world class, cyber security and culture change. Which means hiring experts. CiEdge. We bring both change management as well as cyber security expert to provide end to end enterprise solutions. Old-school security awareness training doesn’t hack it anymore. 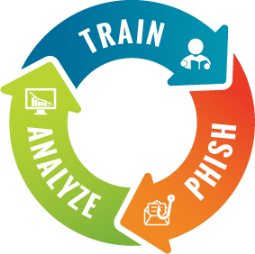 Today, your employees are frequently exposed to sophisticated phishing and ransomware attacks that they need to know how to respond to. Our Security Awareness Training provides them with the knowledge to identify and appropriately react to even the newest attack methods. Best-in-class, fully automated simulated phishing attacks, hundreds of templates with unlimited usage, community phishing templates and custom templates also available. After years of helping our customers train their employees to better manage the urgent IT security problems of social engineering, spear phishing and ransomware attacks, we decided to go back, and look at the actual numbers over a 12-month period. 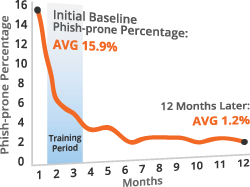 We aggregated the numbers and the overall Phish-prone percentage drops from an average of 15.9% to an amazing 1.2% in just 12 months. The combination of web-based training and frequent simulated phishing attacks really works. CiEdge’s fundamentals is about equipping stakeholders with the right knowledge and skills to create a more secure cyber security ecosystem. The best security technology in the world will be useless unless employees understand their roles and responsibilities in safeguarding company’s sensitive data. 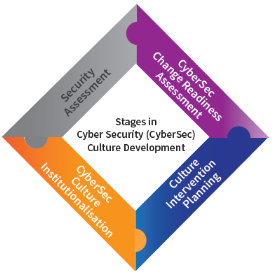 This will involve internalising a strong security culture that promotes cyber security awareness. We help to strengthen your first line of defense to ensure the safety of your organisation by leveraging on our in-house Cyber Security and Culture Awareness expertise. We offer enterprises the only complete portfolio of encryption, access control, and key management solutions that extend protection and ownership across the lifecycle of sensitive data, as it is created, accessed, shared, stored, and moved. Our solutions deliver unmatched coverage securing personally identifiable information (PII), intellectual property (IP) and other sensitive data in databases, applications, files and folders, and network attached storage in on-premises, virtual, and public cloud environments, and as it moves across the network to and through these different environments. We also provide the critical key management sytem needed to effectively and efficiently enable protection across the enterprise wherever data resides. With us, organisations can apply data protection where they need it, when they need it, and how they need it – consistently and effectively. Looking at the risk of exposure to cyber threats today, enterprises need to understand the maturity of expertise, systems and tools that they currently employ to protect them from cyber threats. CiEdge research has scrutinised how cyber security has been implemented by a number of leading cyber security companies, how it will change the way business is directed in the future and it will bring changes to business. Enterprises are already dealing with dynamic attackers operating under multiple guises that change quickly and subtly. CiEdge works with enterprises to analyse information and situation before implementing CiEdge Enterprise Data Protection solutions that are capable to meet end-to-end cyber security requirements covering everything from people, proccess to technology. Talk to us. 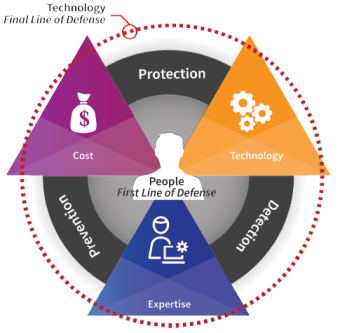 We help to empower your first line of cyber security defense, fortify your last line of defense and share the real truth about cyber securities (and how trying to save cents can cost you thousands).